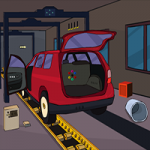 GFG Car Wash Escape is another point & click escape game developed by GenieFunGames. In this game, you have been locked up in a car wash service room. The door is locked and the machine is still running: the car is slowly moving. Make sure to be quick to escape the room. You can find useful stuff and clues for interesting puzzles to solve and finally escape from the car wash room. Good luck and have fun!